This is my 3rd attempt to write and tell you all about my trip to Peru. So, I may do it in series (like Ben's China reports). I went to Peru to climb some very high mountains. I went with Dr. Mike Anderson and local climbing friend, Michael Nad. We joined up with 2 other guys in Peru. Deno Dawson from New York City and David Abell from Albuquerque, New Mexico. Our trip was guided and supported by a company out of Ridgeview, Colorado run by Brad Johnson. This company arranged and provided for transportation, room and board and meals while we were in Peru and in the mountains. They hired Peruvian cooks, guides and porters. This let us concentrate on enjoying the country and the climbs without worrying about the details in a foreign land. We had a long flight to Lima, Peru where we met up with everybody. We then flew to the city of Huaraz on a small plane. This was a thrilling and bumpy ride and gave us our first views of the Cordillera Blanca mountain range. Huaraz was a smaller city located in a valley at the base of the mountain range. It was a good starting point for us to begin our acclimation to higher elevations. We spent several nights at a hostel and did hikes into the hills above town and to some lakes and pre-Inca ruins each day. I was able to do some mountain biking and bouldering. Walking through the streets was interesting and the open markets of the town were incredible and reminded me of things I saw and experienced in Colombia 25 years go. Many of the Peruvians still wear the traditional clothes of the Quechua tribe, especially the further out in the country and higher up in the mountains you go. The day finally came when we drove up to the Llaganuco Valley and began our foray into the mountains. At the drop off point on the road we met up with the "wranglers" who loaded up our heavy gear onto their burrows and ponies. The snow-covered peaks above us were spectacular! I have never seen mountain peaks like the peaks in the Blanca! The valleys started at 13,000 feet and the peaks towered above at 18-22,000 feet. Many of the peaks are jagged, steep and covered with deep snow and glaciers with names like; Churup, Pisco, Huandoy, Chacraraju, Tocliraju, Alpamayo and Artensuraju and of course, Chopicalqui our main objective. Our first base camp was in the valley below the peaks of Pisco and Huandoy. We spent 5 nights at this 15,000 feet camp in a green grassy meadow with a stream running through it. Each day we ventured higher onto the mountain. Our first significant day up on the glacier in the saddle between two peaks (at 17,000 ft) brought on trouble for one of the members of our party. 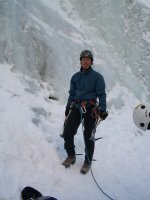 David began to have trouble breathing and developed HAPE (high altitude pulmonary edema). I was called upon to help evaluate and treat him through most of that night and the next morning he was sent back down to town with a porter. He never did rejoin our group and eventually flew back to New Mexico. I did experience some illness during that time with some stomach trouble which I attributed to contaminated water. Fortunately, I quickly got better after taking some medication I had brought with me. Our first peak that we climbed was Pisco (18,876 ft). It was a gorgeous day with no wind, clear skies and excellent snow conditions on the glacier. The views from the summit were awesome! I felt strong and knew that climbing higher on the next peak was looking quite possible. After climbing Pisco we moved our base camp across the valley to the base of Chopicalqui.We took a rest day and then readied for the 2 day climb up this incredible mountain. Again the porters helped bring up gear which made for light packs. We started climbing on the morning of July 4th. We made a high camp at 18,000 feet on a narrow ridge on the glacier on the southwest ridge of the mountain. When the sun went down that night, it got very cold. We climbed into our tents at 7 p.m. and tried to get some sleep. At 1:30 a.m. we started to get ready. After a quick breakfast of yogurt and granola we climbed out into the darkness with our headlamps and put on our harnesses and crampons. We divided into rope teams and began our climb to the summit (20,853 ft). We estimated it would take us 5 hours to reach the top from our perch of a camp on the ridge. For the first time we all carried and used 2 ice axes as some sections of the mountain were very steep. The skies were clear but the stars were not that great because we had a full moon and the moonlight was bright especially with the reflection off of the snow. We almost didn't need our headlamps. The climb became difficult because of wind. The windchill was brutal! It made the climbing seem a lot harder. Every step was taken with the feeling of fatigue and I was breathing very fast and deep. However, climbing steep ice and snow on narrow ridges was very exciting and I looked forward to reaching the summit. As we neared the summit, the sun came up and the warmth was very much welcomed. We only stood on the summit for a few minutes because of the high winds and cold. It required several rappels off snow anchors to get down the top 800 feet of the mountain. The lower we climbed down, the warmer it got and soon we were back to our high camp sipping on hot chocolate and eating. We finished climbing back to base camp the same day and arrived at 6 p.m. quite exhausted to say the least. I have been having trouble posting. I am getting ready to start my travels home. The trek into the mountains of the Cordillero Blanco was successful. I was able to climb two peaks. 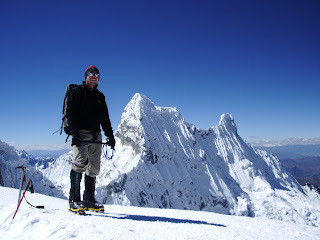 The highest peak, Chopicalqui, was quite a challenge and I will tell more about that climb later. It will be nice to get home to warm weather again. I have been camped out below glaciers or on them for the past 10 days. Today is July 7th. I am in the city of Huaras in Peru.